It is surrounded by a fence and barbed wire. You need the gate code to get in. The people inside tell themselves that the security is for their own protection, to keep others out, but if you go inside and listen to them, you understand that the chain link fence to keep them inside. Think I am speaking of a serious mental institution? I could be, but I am not. I am speaking of our local county airport. Don’t feel safe just because you live far away; I have visited countless small airports all over the country, and I am willing to say that most of them had plenty of nut jobs that needed to be fenced in. Follow my little adventure and understand a bit more about the mentally ill people who can be found at most airports…. Last month, My friend Doug was in town, and our task for the day was a simple one. Doug had heard about a Maule M-4-210 for sale at a municipal airport about 30 miles away. Both Doug and I own gliders, and we have been looking for a potent tow plane. Doug wanted to look at this one because it has a 210HP six cylinder Continental and a constant speed prop, and he could do a lot of things with the plane besides tow. The plane was said to be recently covered, fitted with a fresh engine and reasonably priced. The owner gave us a green light for a through inspection and invited Doug to fly it if he liked. It all sounded simple enough, but we made the mistake of going there on a Saturday, which is the day most of the inmates are at the asylum….. Above is a photo of B.D. Maule and the prototype M-4. While the factory has been located in Georgia since 1968, This photograph was taken in Michigan were Maule was a long-established aircraft Company. We did a 45 minute inspection on the plane. In that length of time, a large number of inmates came by to tell us things. It would be inaccurate to say they came over to speak with us, because I didn’t detect that any of the listened to a word we said. I want to be accurate, and not imply that every thing people said to us was crazy. Out of 8 or 10 people, one guy came over just to ask what time it was. He seemed normal. Everyone else had something wrong with them. Below, in Red, are a sampling of things that were said to us. S.E Hinton famously wrote “Even the most primitive societies have an innate respect for the insane” abiding by this, we just nodded our heads when they spoke. My comments in Italics are just my thoughts, I didn’t really engage any of these people. Reality: B.D. Maule was born in Ohio. He lived most of his life in Pennsylvania and Michigan. 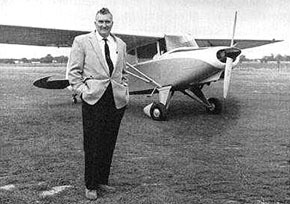 His aircraft company was started in Michigan, and he did not set foot in Georgia until he was 57 years old. Reality: The 1966 model we were looking at was made on the assembly line in Michigan. It said so on the aircraft’s data plate. Reality: Gliders have a weak link in the rope so that you can’t break anything while towing. The breaking strength of the link varies with the weight of the glider, but it us just a few hundred pounds at most. The line it self is a piece of line that looks too light to hang clothes on. A single 1/16″ welding rod has greater tensile strength. The only cable that runs forward is the release cable that opens the hook, it is made of very fine cable and it is never under tension. Reality: Between us Doug and I have 48 years of being an A&P. The starter was not new, It was freshly spray painted, but this looked like it was done in place. It was a 90 degree drive style, which can cost thousands of dollars if you actually buy a new one. This one had a broken internal clutch spring. The guy making the claim was the plane owner, who was neither a pilot nor a mechanic, but felt his general expertise covered both subjects. Reality: This aircraft is type certified, and you most certainly need to be a mechanic or work directly under ones’ supervision to do anything substantial on such a plane. If you gave me a choice between having your average weed-smoking skydiver and Helen Keller work on my aircraft engine, I would choose Ms. Keller, even though she is deceased. Reality: the type certificate data sheet for every certified aircraft specifically states the exact control deflections. You are required to have every bit of it available. Good homebuilt aircraft plans also specify these exact figures. 1) There is no ‘safe’ airport. Don’t think for a moment that because it happened in the south that you are safe because you live elsewhere. I have had hours like this at airports in every part of this country. Make your shop ‘safe’ from idiots. You wouldn’t let the biggest idiot at your local airport into your home, but if you read stupid things from unqualified people on the internet, you are essentially inviting the biggest idiot on the planet to come and work on your plane. Think that over. At least 50% of major mistakes on home builts originate as ideas from the net proposed by people the builder never met. 2) You will never help these people, do not engage them or try to speak with them. You are far better off pretending you don’t speak English. If they overheard you, then try quietly telling them that you are on an undercover assignment for the FAA. If they offer to help you with anything, ask them to hand you a tool, and then tell them that you used to have highly contagious “Genital Leprosy” , but the CDC in Atlanta is pretty sure you are in remission right now. 3) If you accept the premise that you can learn a lot and get smarter by hanging out with smart and clever people, than you must also accept the WW corollary that “Stupidity is a Contagion” Do not spend any time with these people, do not socialize, hang out with nor have a single thing to do with them. I directly attribute my 2001 accident to allowing my standards of what I did in aviation and who I did it with to be eroded slowly by being around idiots. 4) Your home built is a clean state. It isn’t polluted by the misguided effort of every previous owner who opted to have the cheapest person work on it rather than the best. Be glad you are building your own pure plane. If you let idiots talk you into incorporating stupid things into your project, then you might as well just go out and buy the worst used plane, owned by the biggest idiot at your airport. Keep your plane a thoroughbred. 5) Your are a clean slate. If you don’t know how to fly nor build a plane or an engine, Good. Then we can get you started right, and you will not have to undo any bad habits or false ideas. Succeeding in this game is all about picking the right people to learn from, developing good judgment, and then exercising it. You are not going to accomplish any of these things by spending time with the inmates at your local asylum, so just stay far away from them. 6) There are many great people in aviation, and over time you can make life long friends with many of them. Do not accept lesser quality in place of real aviators of skill, ethics and judgment. We have fun at Colleges because I have made sure we do not welcome nor tolerate idiots and fools. The definitions of those two words don’t have anything to do with how much a person knows about planes or flying. It has everything to do with character, and as a thoroughbred, even a green one, you deserve quality company. If you have already encountered your quota of fools, change your setting and find better people. Did you buy the plane. There’s advice and then there’s wisdom. This article is most assuredly the latter.